Saudi Arabia has been looking for ways to increase its involvement in Syria with plans ranging from a full-on ground war to just sending jets to Turkey. As Russia escalates it bombardment of groups fighting Syrian President Bashar al-Assad, the Saudi Foreign Minister floated the idea of arming rebels with shoulder-fired surface-to-air missiles, which is a strategy we’ve seen used against the Russian Air Force in the past—to great effect. Embattled ruler Bashar al Assad’s forces, which were deep in retreat until Moscow came to their rescue last fall, have made huge gains with the help of Russian’s brutal bombing campaign and wholesale support. Now they are on the offensive, tightening their noose around the long-time resistance battleground metropolis of Aleppo. If history has taught us anything, it is that once the ability to use air power with impunity is taken away from the enemy, the playing field becomes leveled and there is a high price paid by the side using air power, both militarily and politically. The Russians learned this the hard way. After the CIA’s introduced the FIM-92 Stinger man portable air defense system (MANPADS) into Soviet Russia’s war in Afghanistan in the 1980s, the tide of that conflict changed drastically. Russian attack aircraft and helicopters that once preyed freely on Mujahideen fighters freely started falling out of skies in flames at an alarming rate. Eventually, after a decade on bloody and expensive warfare, the Soviets left Afghanistan as a failing power. Surprisingly, much of the same equipment and tactics are being used by Russia some 30 years later over Syria, which makes their aircraft once again vulnerable to the same missile systems. This fact is tell as Russia used MANPADS to severely hamper Ukraine’s effort to crush pro-Russian separatist forces in the country’s east. The fact that Russia is using few precision guided weapons in its air war over Syria, and largely lacks modern targeting pod technology, is their Achilles heal. If they want to be even close to being accurate when attempting to strike small targets, their fixed-wing aircraft have to attack at lower altitudes. Their helicopters are a whole other story, as they are operating at low-level in the daytime making them incredibly vulnerable to potential MANPADS attacks. With all this in mind, if Saudi Arabia or other Sunni Arab states backing rebel forces in Syria were to furnish these forces with MANPADS, it would largely take what has been game-changing Russian air power out of the equation. At the very least, the introduction of MANPADS into the Syrian conflict would highly degrade the frequency of Russia’s air operations—and it would make Russia pay a much higher price, both in the use of expensive smart weapons that can be dropped from higher altitudes accurately. It could also potentially lengthen their involvement in Syria’s civil war by drastically lowering their sortie rates. And if Russia were to have to bomb from higher altitudes and did not use precision weaponry to do so, the political impact, both at home and abroad, could also be debilitating. Russia is already under intense international scrutiny for its bombing tactics in Syria, and support among the Russian populace for the only months long operation has fallen by double digits in recent weeks. If the conflict were to extend greatly in duration, and if Russian aircraft were being lost regularly, support could plummet even further. Yet the question still has not been answered as to how the Saudis, or anyone who supplies such dangerous weapons to Syrian rebels, plans on keeping them contained to just the Syrian conflict and out of the hands of potential terrorists. 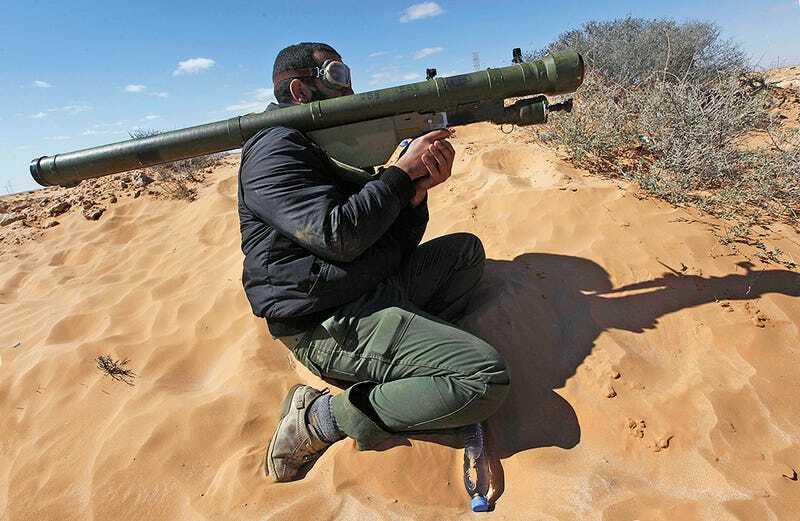 A MANPADS intended to take down a marauding attack helicopter could just as easily be used against a civilian airliner. Then again, thousands of these missiles have already gone unaccounted for throughout the region, with thousands of them being looted from Libyan stockpiles during the fall of dictator Muammar Gaddafi alone. The conflict seems to be at a critical juncture as international diplomacy attempts to broker a ceasefire that will open the door to a negotiated settlement on the conflict. This was supposed to happen last week, but the window came and went without a cease fire being implemented. Now another agreement hopes to bring about a similar cessation of hostilities on February 27th, although there are only a few indications that this attempt will be any more successful than the last one. If some sort of interim peace is not successfully achieved, it is likely the lines in the sand between proxy clients will become much deeper and clearer. As these parties become more involved in the actual fighting in Syria itself, the conflict will become more internationalized, complicated, and volatile. It will also likely result in new capabilities being introduced into the conflict, such as MANPADS. If this were to occur, how exactly Russia will react to their aircraft being fired upon, and even brought down en-masse by Sunni Arab state supplied MANPADS remains unclear. At the very minimum it will dramatically increase tensions between the U.S., who is seen as leading the anti-Assad coalition, and Russia who is implicitly supporting Assad. Adel al-Jubeir went on to say in that interview that it’s improbable Syria could bring about a third World War, but noted that the current conflict didn’t stay within Syrian borders for long. Iran has sent its Revolutionary Guards in to help prop up Assad, along with terrorist quasi-state actor Hezbollah. Just as well, al-Jubeir said that Shia militias from Iraq, Pakistan, and Afghanistan have all joined in. Throw in Russia, the Americans, Saudi Arabia, Europe, and the Arabian Gulf states, and you have quite an interesting mix. The air campaign started, but it became very obvious that there may have to be a ground component. Saudi Arabia has said that if the US-led coalition against Daesh is prepared to engage in ground operations, we will be prepared to participate with special forces. The Russians say their objective is to defeat Daesh, too. If the deployment of ground troops helps in the fight against Daesh, why is that World War III? Is Russia worried that defeating Daesh will open the door for defeating Bashar Assad? That would be a different story. But I don’t think World War III is going to happen in Syria. Not really the most direct answer, and Russia clearly sees such a situation differently, outright stating that if it escalates it could easily result in another World War. Now we will have to see if peace, even a shaky one, can actually prevail in such a fractured and tormented place. If not, we should know very soon if the Syrian conflict will become a deeper, more deadly international affair.